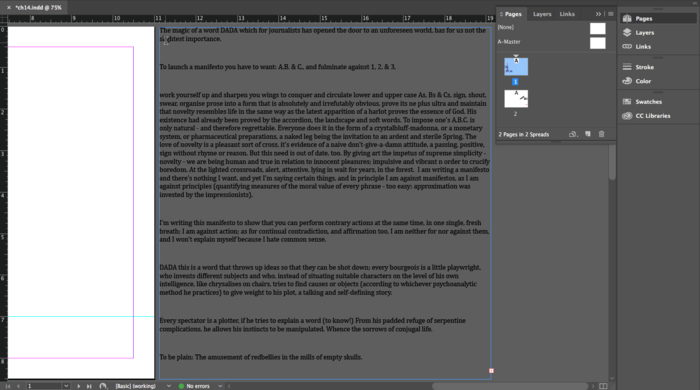 Difference between revisions of "Chapter 14 CC18"
'''3.''' 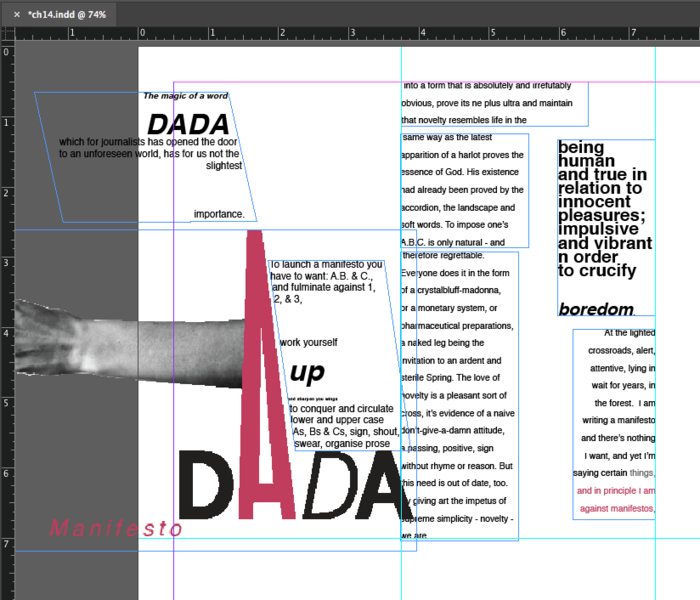 Double-click on Page 2 then click File > Place to import the graphic named “dada-title.ai”. 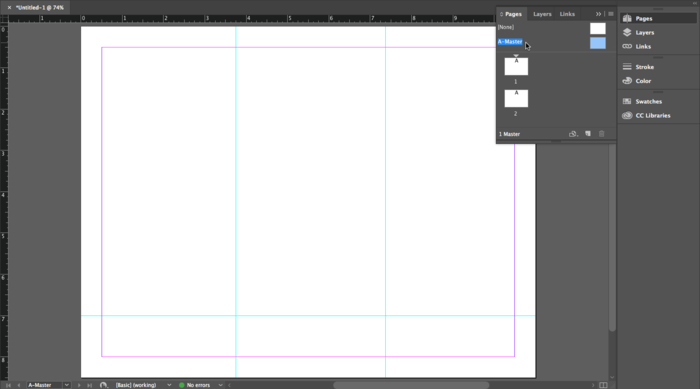 Remember that File > Place creates a loaded cursor, so you have to click the mouse to load the image onto the page. 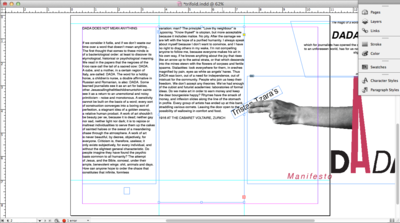 On page two, the baseline of the word, “Manifesto” should rest on the guide at seven inches. 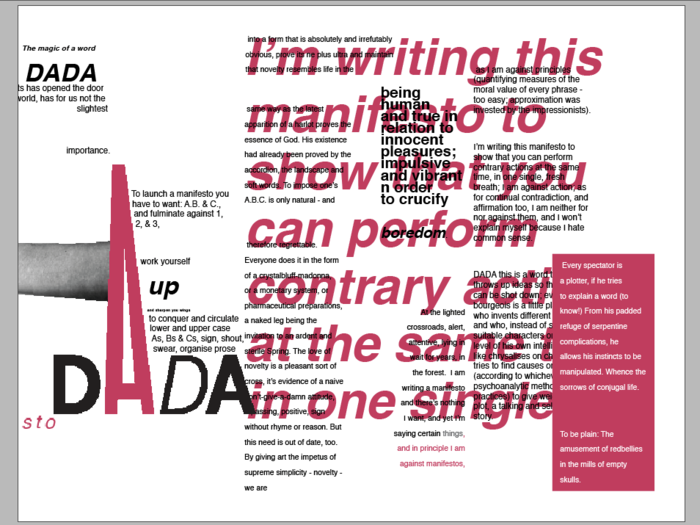 The “e” in Manifesto will barely touch the edge of the page. 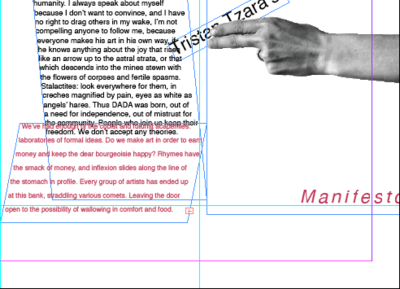 Create a text box and type “Tristan Tzara’s”. 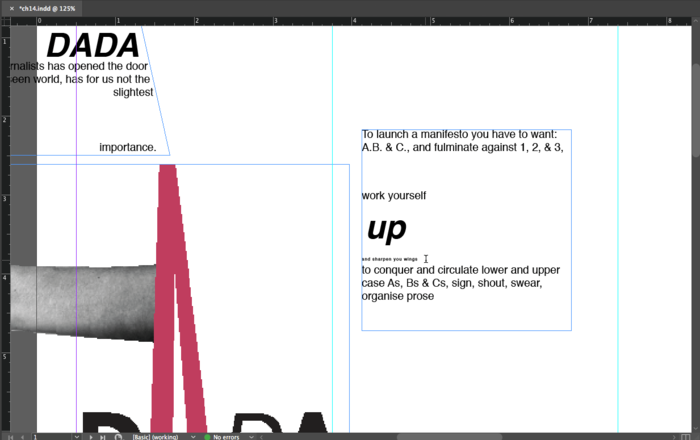 We used the typeface Helvetica in the style Regular at 24 points and leading set at 28.8. 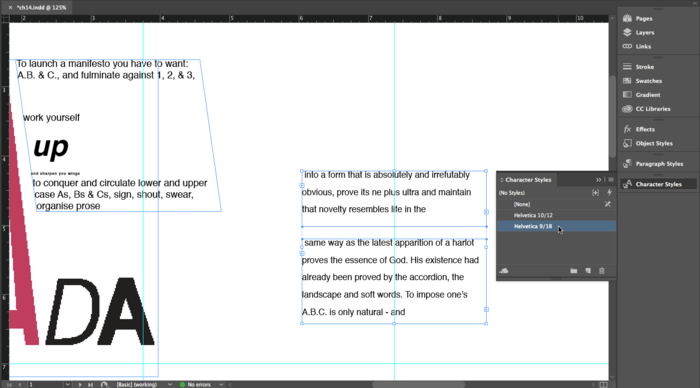 For the rest of this chapter we will refer to the font face, style, point size and leading like this: Typeface style size/leading. 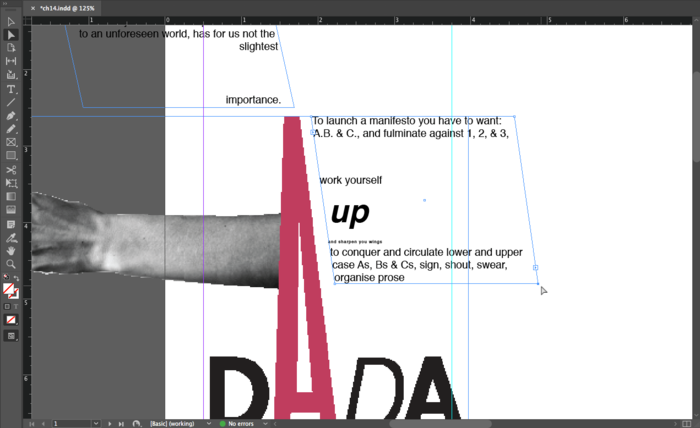 For example, we used Helvetica Regular 24/28.8. 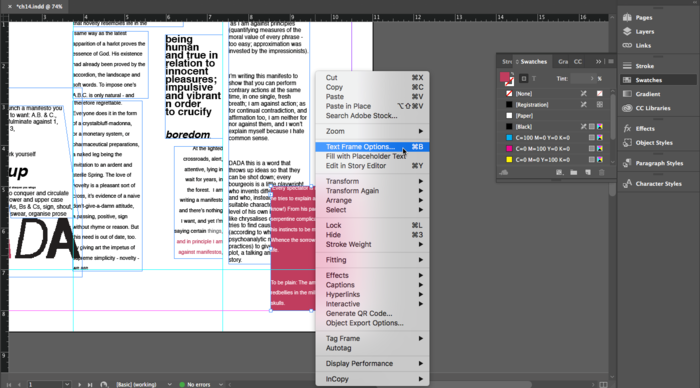 Send the text box to the back using Object > Arrange > Send to Back. 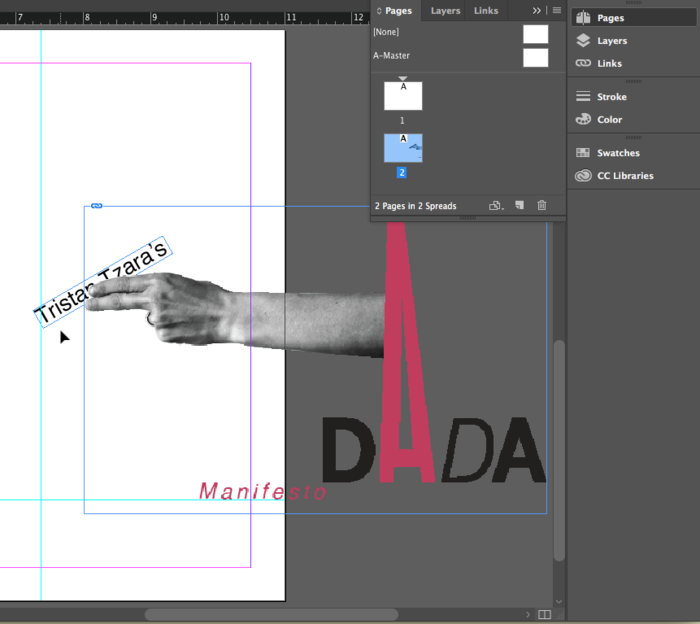 Place the text just beneath the fingers as in the image below. 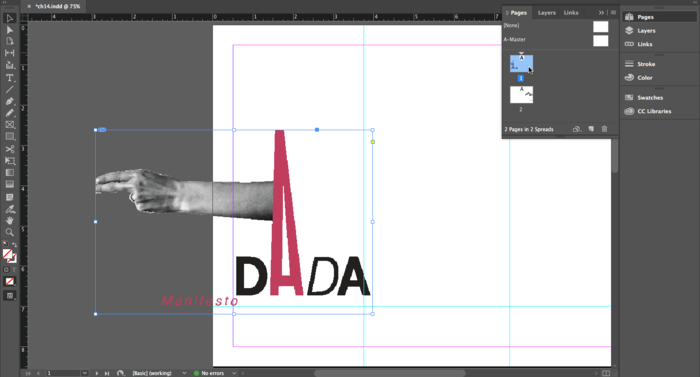 Click on the Rotate Tool in the Tool Palette and click and drag to the left on the type box. 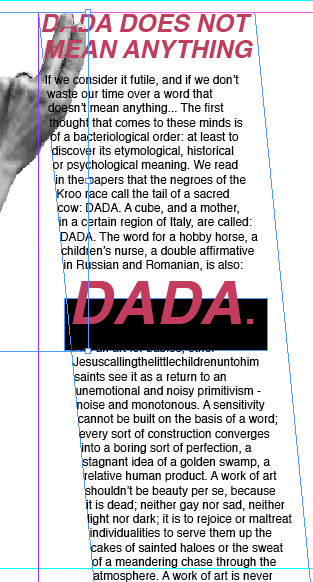 The rotated text is the only element on this folded part of the page that is not on a horizontal or vertical grid. The rotation creates contrast. 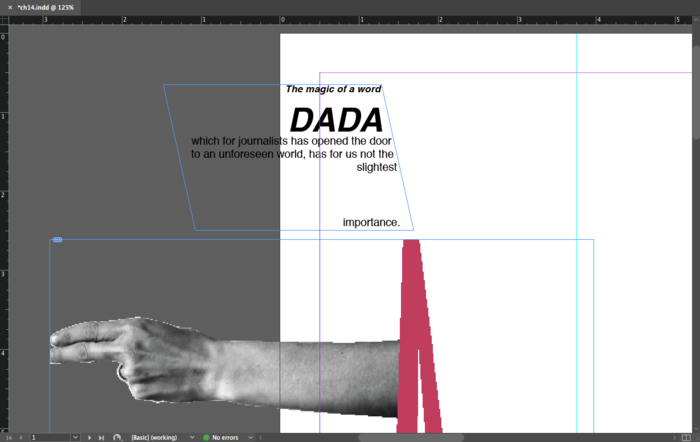 Even though the letters are partially hidden beneath the fingers, the viewer is directed to the typography. 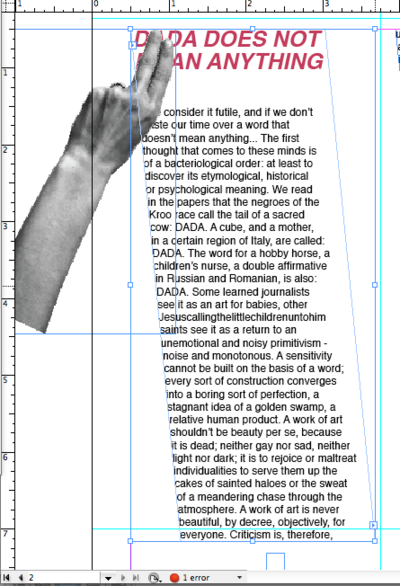 Contrast is created due to the break in repetitive use of the grid. 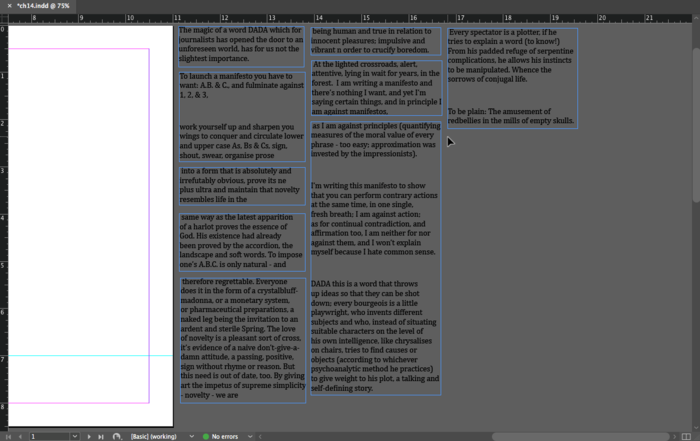 A common exercise in print design is the tri-fold brochure. 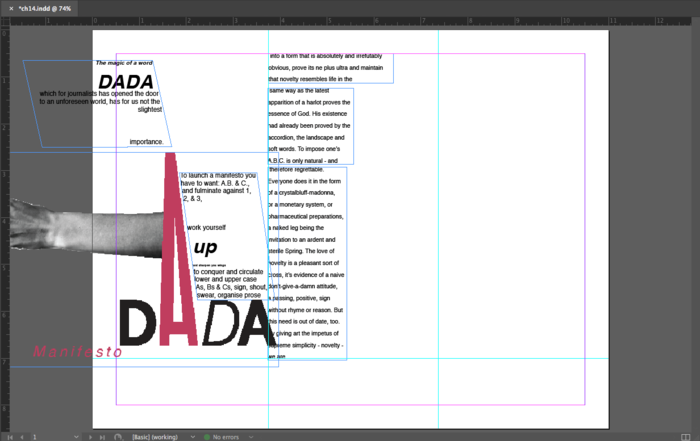 A trifold is one page of paper, folded twice at one-third of the length or height of the printed page. Typically this is first done on a standard letter size sheet of paper in landscape orientation (11 by 8.5 inches). 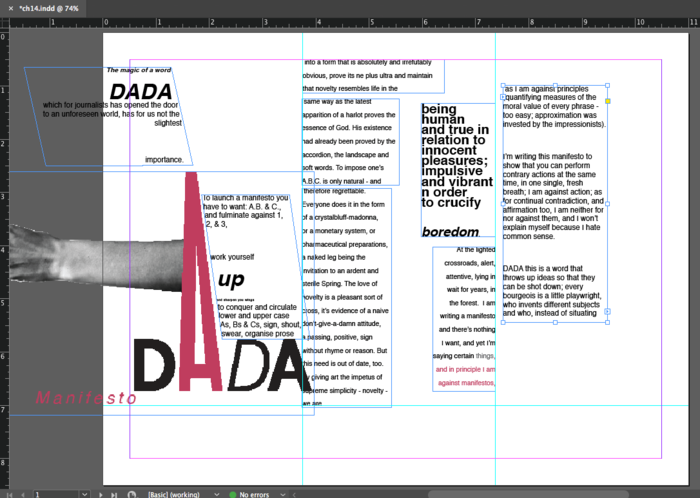 The folded areas can be thought of as "gutters," where you would normally want to avoid placing text. 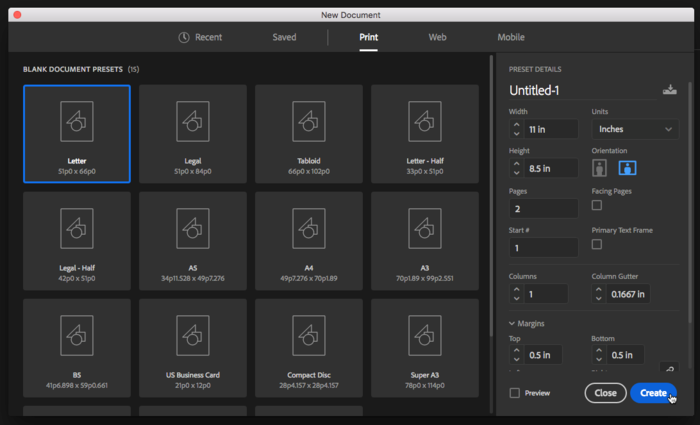 Images can run across a fold, but only if they are much larger than the folded area. 9. Position the text frame so the word “importance” is over the top of the letter A. 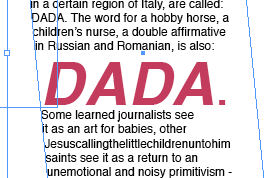 Also notice that the "s" in "has" (on the second line) is just barely within the margin. 13. 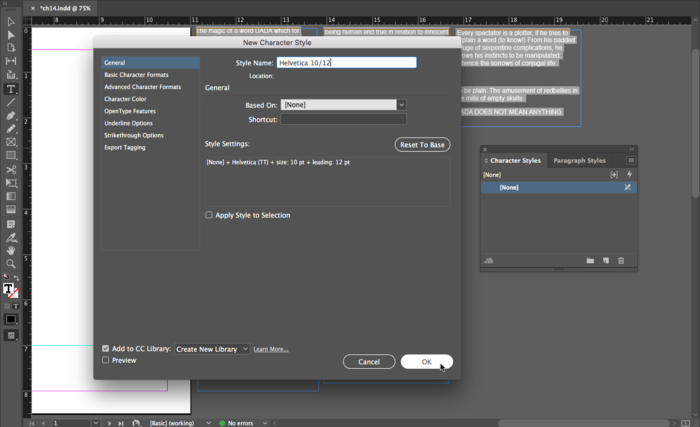 Apply the character style to the fourth text box and use the Selection Tool to modify the width of the box on the page. Send this text box behind the title graphic. 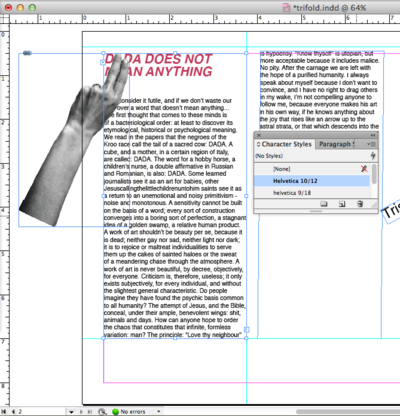 Align the left edge of the text box with the left vertical guide. 14. 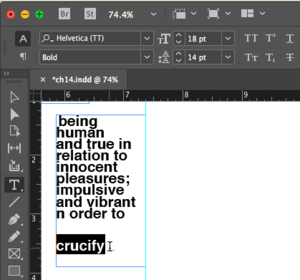 Set the type in the text frame from “being human…” to “crucify” in Helvetica Bold 18/14, which tightens the leading and creates tension in the typography. The letters overlap because the space between the rows of letters is smaller than the size of the letters. 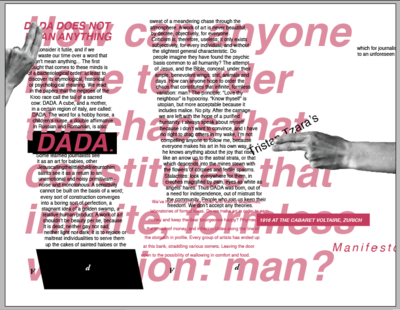 This type treatment could be difficult to read. 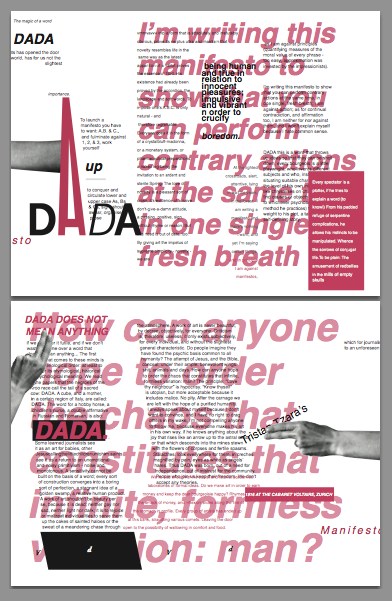 However, at a larger font size than body copy (typically 9 – 11 points), a small section of text with tight leading creates tension and remains legible. 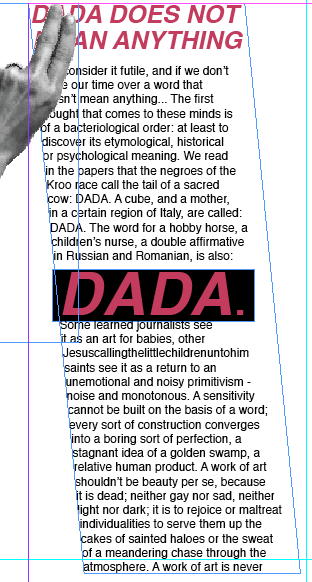 Open the leading a lot for the word, “boredom” at the bottom of the text frame. 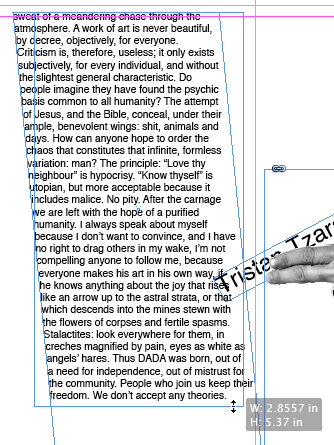 In the illustration below you can see the type settings we used, but try seeing this with your eyes and intuition. Use the cursor to highlight the word “boredom” then use the key command OPT+Down Arrow to open the leading. 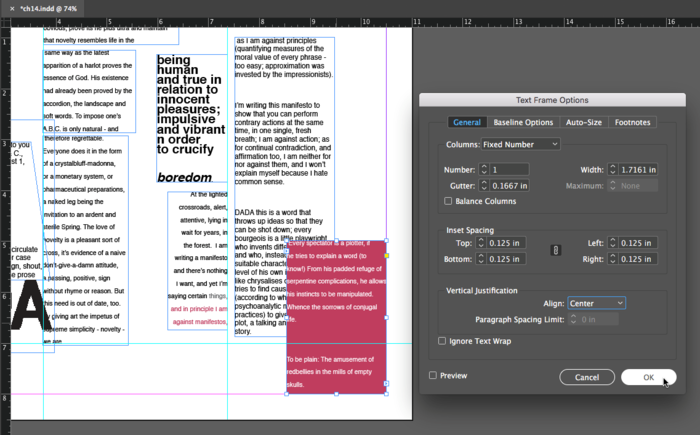 Align the right side of the text box with the right vertcal guide.